Entrance tickets are required for both our students and their guests. All tickets are complimentary and should be ordered by the graduate when completing the Commencement registration/order form. Graduates receive their tickets during pickup week along with their apparel and other items they ordered. If you are attending a school, college, or departmental graduation celebration please check the information for that ceremony to determine if tickets will be required for those events. We will begin posting information about school, college, and departmental events on this website beginning in February. All guest tickets are for general admission seating, except those reserved for disability accommodations. 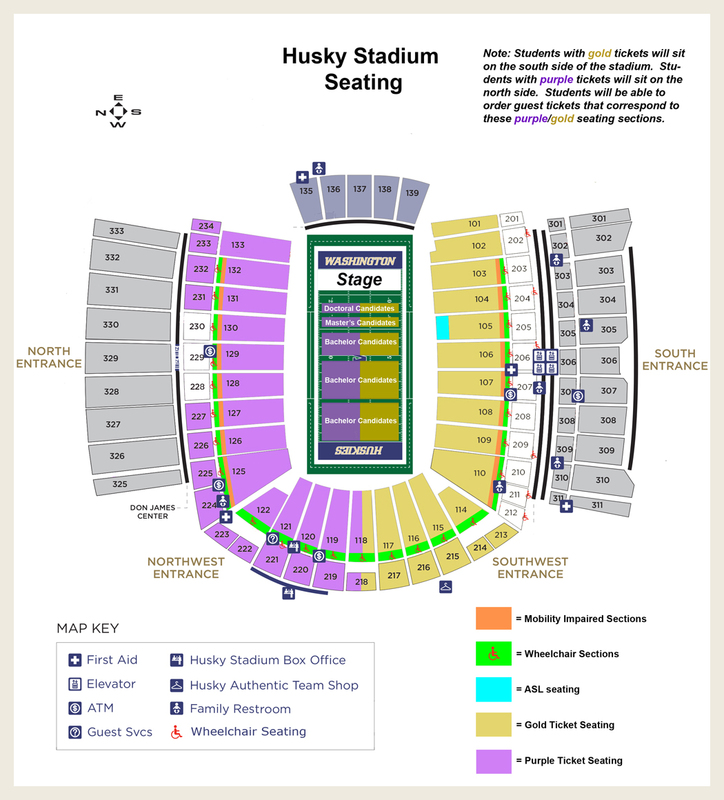 Guest tickets are either purple, for seating on the north side of the stadium, or gold, for seats on the south side of the stadium. The color coding corresponds to a similar coding for student tickets. 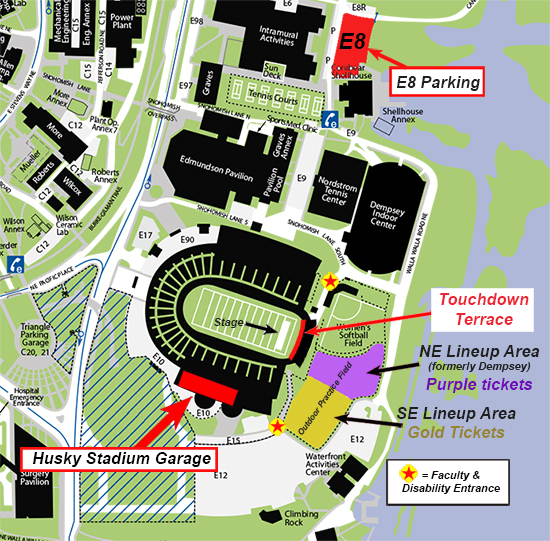 Students with purple tickets will sit on the north side of the field; those with gold tickets sit on the south side. In this way we hope to have parents and guests seated on the same side of the stadium as their graduating sons, daughters, family members, and friends. We ask that students confirm the attendance of their guests before ordering, so that tickets are available for all who want them. All reasonable requests will be met. We will do everything possible to ensure that students are able to invite as many family and friends as they wish. If, after completing the Registration/Order Form, students require additional tickets, they may request them during pickup week at the University Book Store. All graduates are required to present a student entrance ticket along with a UWID or other ID to gain entrance to the student line-up areas. No student will be admitted without a ticket and appropriate ID. Entrance tickets will be automatically issued to those who complete the Registration/Order Form for the ceremony. When graduates fill out the Registration/Order Form in May they will be asked about any disability accommodations they might need. An instructional email will be sent regarding accommodations on Commencement Day. There are two faculty and disabled student entrances to the lineup area – one on the north, one on the south – that may be used students with disabilities, if they wish. They can be seen on the map shown here. Certain sections of the stadium have been reserved for guests with special needs including special wheelchair sections, mobility impairment sections for those who might have difficulty with stairs, and American Sign Language section, and assistive listening devices. Students may order tickets for these sections when they fill out the Registration/Order Form. Disability parking is also available. For more information please visit our disability accommodations page and our parking page.